Combining elegance with a sporty touch, this watchband is skillfully crafted and boasts a distinct, decorative contrast seam in an elegant, sporty design. The semi-matte distressed leather made from fine Italian Calfskin is perfect for all modern and sporty watches and in particular, sturdy chronographs. 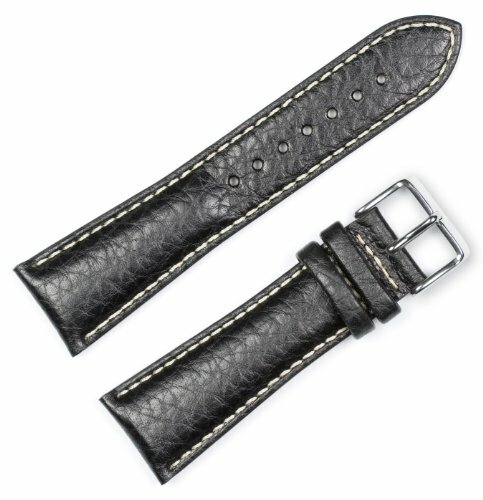 Nubuck lining and heavy padding round out the features in this watchband. 7 1/2" Long. Standard buckle color is silver. Gold color buckle can be requested through e-mail color choice - reference your order number. Sizes 12mm through 28mm. For thicker, chronograph style watches.